The Zirconia Bridge is the premium restoration after the All On Four implants surgery. The full arch zirconia implant bridge is the strongest, safest, and the best way to rehabilitate those implants. - What is Zirconia Bridge? - Why the Zirconia Full-Arch Bridge Is the Finest Restoration? - Where Is The Zirconia Bridge Manufactured? - How Resistant Is A Full Arch Zirconia Implant Bridge? The first step to get a Zirconia Bridge is placing the dental implants. After the implants surgery, we need to wait four to six months of the Osseointegration period. During that waiting time, the bone will bond with the implants. The foundation will allow us to fit on top of those implants a permanent restoration like a fixed, full-arch Zirconia bridge. You can also find the it with the name of "Prettau Bridge" or "Zirconia dentures". A full-arch Zirconia bridge is a screw-retained implant bridge that sits gently on your gumline. It is a palateless denture that is fitted and secured on the head of the implants (with abutments) previously placed into your bone. Why the Zirconia Full-Arch Bridge Is the Finest Restoration? A full arch zirconia implant bridge manufactured in our milling center. The Prettau bridge is made of Zirconia (Zirconium Dioxide from Zirkonzahn®) It is a high-quality ceramic material that creates the most durable and natural-looking dental restoration. Zirconia is also stain resistant too. It is a non-porous texture, and therefore it does not absorb any bacteria or odors. Getting Zirconia teeth is a guarantee. It is a reliable, strong, and durable material and you can stop worrying about chips or cracks on your bridge. The quality of the finish is highly aesthetic; it is almost impossible to recognize from natural teeth! It is the most durable available material for palateless fixed bridges. Where is the Zirconia Bridge manufactured? We are proud to be the only dental clinic in the Cancun area with a completely digital laboratory and milling center. At our in-house digital laboratory, we mill a Prettau bridge made of Zirconia that we will fit over the All On 4 implants. We only work with CAD-CAM dental technology; Computer-Aided Design and Computer-Aided Manufacturing. We will mill the Prettau bridge at our laboratory. To achieve the natural look of your Prettau bridge, our ceramists work intensively on the finish. Glazed pink porcelain will naturally replicate the gum line. You should treat your new Zirconia teeth as your original teeth. Brushing three times a day and mouthwash need to be part of your daily habits. Also, visits to your dentist every six months for a checkup and a deep cleaning of the Prettau Bridge are necessary. The dentist removes it (unscrews it) and will do a deep cleaning on it. They will clean the housings and check the health of the gums around the implants too. If you take the right care of your Prettau bridge and of your implants, it can last a lifetime! How resistant is a full arch zirconia implant bridge? Many patients ask about the Zirconia bridge strength and if it is possible to fracture. You can relax and know that your bridge will not chip or crack by eating any type of foods. 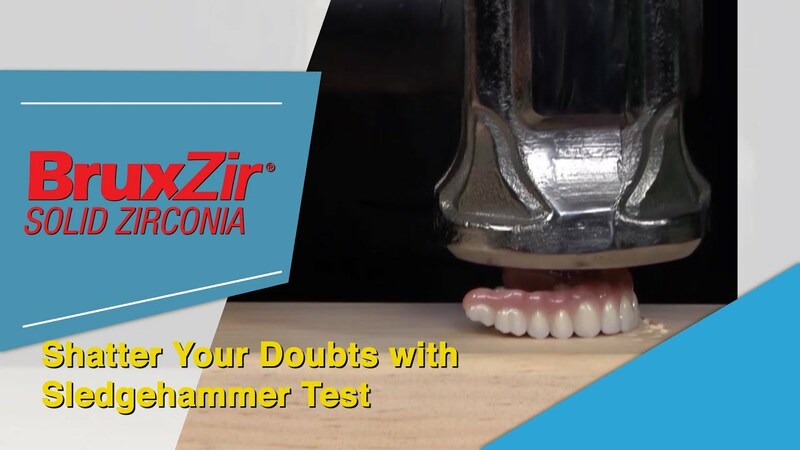 Take a look at this video of a hammer test over a set of palateless Zirconia dentures. This is how resistant Zirconia Bridge is! Click here to contact us today and get a FREE quote! (price per arch, upper or bottom). Please click here to view our complete price list. It is an investment on yourself that can last you a lifetime!